One of the most important questions a woman can ask herself is: What do I REALLY want? And by “what do you really want” I don’t mean “a good job” at “some decent company to “live well”. Which are justified answers, but I am talking about something different! If you dig down to the deepest layer of your heart & soul, what is your purpose of being here? What makes you forget time & space? What makes your heart beat faster – which activity brings you so much fulfilment that you would work for free for the rest of the life (if you didn’t need money). What makes you forget time & space? What makes your heart beat faster – which activity brings you so much fulfilment that you would work for free for the rest of the life. Sometimes it is not easy to find your own path, in the hustle of every day life. Expectations of society, opinions of others might make it comfortable to stay on the main track! Or sometimes we ourselves are too BUSY to know what we really want in life. Who am I? What is my strength that sets me apart from others? What makes me special? – These questions might sound so simple, but if you ask around many people will struggle to find meaningful answers! A couple of years ago, I could not give you an answer myself. It has been a along, but rewarding journey since then (not to lie with great hurdles to tackle, but so much more happiness & fulfilment). A couple of days ago I came across a quote by Guillaume Wolf “Prof. G”, a French-American teacher & author: Be yourself, Believe in yourself and Express yourself (B.B.E.). – And it got stuck in my mind. Only if you start to – be unapologetically yourself, express your individuality and believe in yourself – your true strength will manifest! It all works in a circle: Your superpower lies in your uniqueness and the more you live it, the more powerful your individuality you will become. You real job in life is to figure out why you are here – and get about the business of doing it. 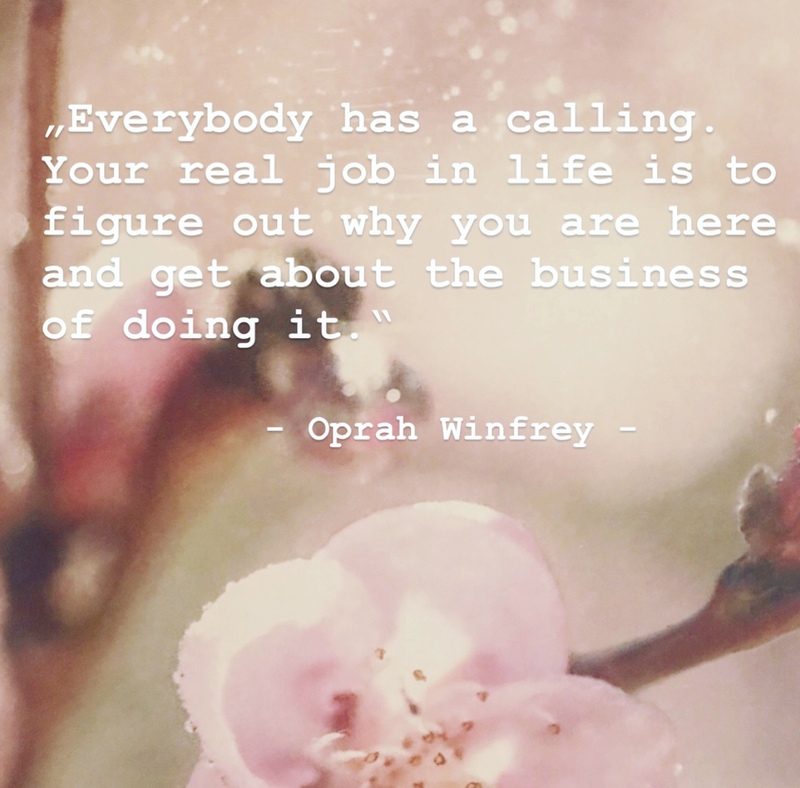 I read this quote by Oprah Winfrey a couple of weeks ago in her book “Wisdom of Sundays”. Have the courage to take on this journey, and many questions will be answered. If you have found your purpose, always remember, your vision is for yourself. There will be many times (I can guarantee you many times), when other people can’t see it. And that is totally fine. YOU are gifted with this vision, only you have the ability to bring it to life – and make it visible for others. Posted in Lifestyle and tagged Inspiration, life, mission in life. Bookmark the permalink.